You must be very a savvy Homeowner to have researched our humble, yet extensive web site on rain management products for your home; which can save you a great deal of grief and thousands of dollars with a rust-free gutters replacement. Compared to what our competitors have to offer at any price. My long time-line is the most common detractor for most potential clients, since I am typically booked up 6 months or more over the last decade. As a result I wind up turning away 3 to 4 clients for every 1 I have time to take on. I can assure you there is no better value on the market for all what I put into each project. Especially when you could not pay another Gutter Contractor enough $ to do what I do without even being asked; as listed on my Quality Standards page. They will claim many of my 'high falutin' details do not matter, but what does that really say about their attitude towards the work they do? Shouldn't they care about all these small details? Our exclusive gutters system is mounted with thicker #12 shaft stainless steel screws = to 1 screw per foot, which is 4X the fasteners Building Code requires. 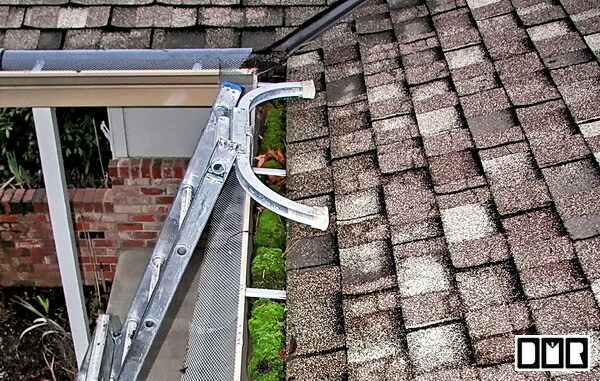 We slope the gutters to fully drain, which is terribly uncommon. Along with many other advantages too numerous to list in this paragraph, but detailed on our Quality Standards page linked to above. As a Gutter Contractor for the last quarter century most of my work has been replacing rusted out gutters, so I do not install steel gutter as a matter of ethics. Yet most Contractors around here do. A simple sturdy screen cover that is effective to keep out the larger debris and continue to let water through, which is also less expensive than most other covers; sold at upwards of 5X more. Yet had proven to fail in short order, because the screen holes are way too small. Some times keeping it simple is the best solution, as in this case. Think of a sink strainer, and how often you need to clear it out. 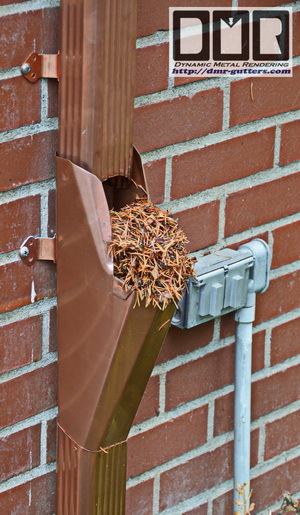 A 2X to 4X larger outlets, so the gutter is less apt to clog and over flow, as they often do. This detail is far more relevant than the size of a gutter. 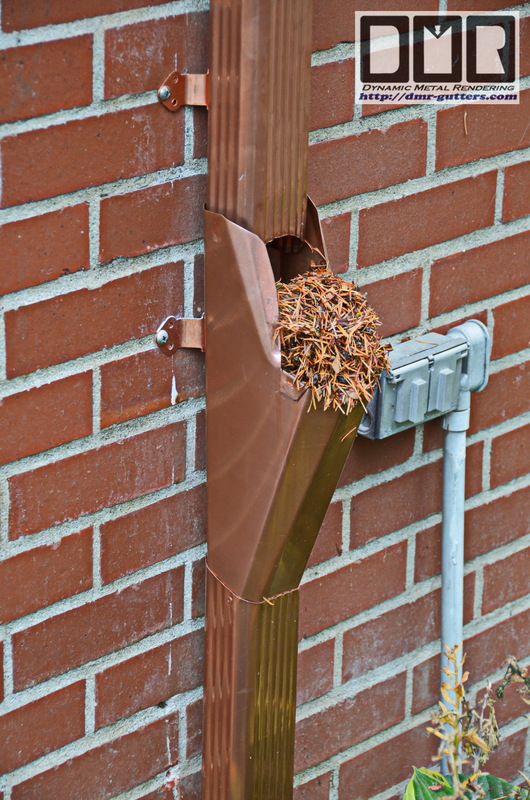 A more User-friendly strainer mounted down low in the downspouts (which we make) called Leaf-catchers. This allows you to easily access that debris w/o tools or climbing a ladder in the worst of weather when you notice you have a problem. These very popular Leaf-catchers (as seen below) is the main reason Homeowners hire DMR to replace their gutter system. Any Contractor not offering all 3 parts: gutter cover, larger outlets, & downspout strainers are missing the mark and not to be trusted. "Quality & service is not expensive. It's priceless!" If your gutters are OK it can help a lot to just replace your downspouts with those 2 advantages listed above and add screens over the gutters for a fraction of what a full gutter replacement cost to achieve a huge functional advantage. 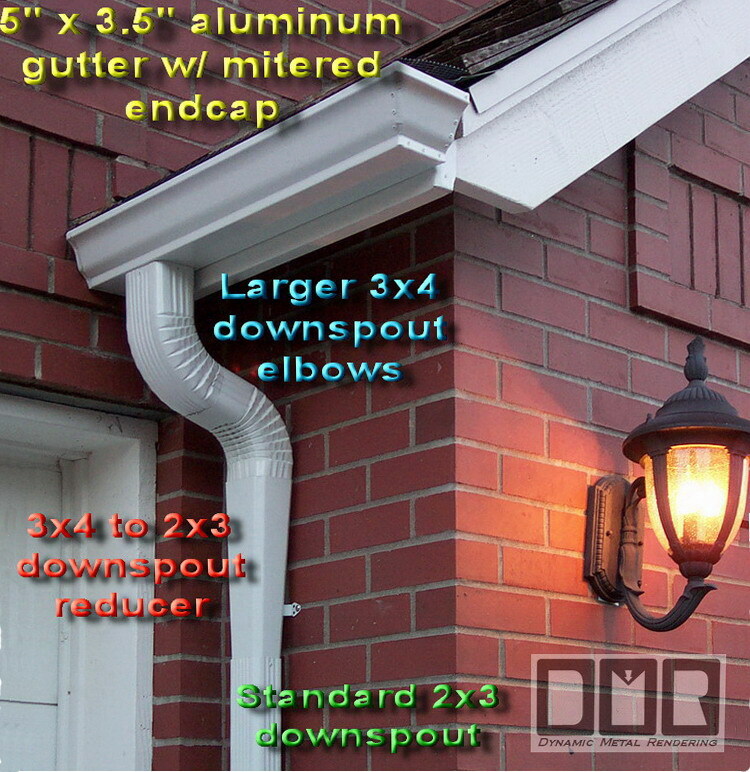 An aluminum downspout replacement with these advantages typically runs just $225 to $275 per downspout depending on how long it is. Screen w/cleaning runs $3.50 ln' on a one story house. 1. Steel gutters that are thinner than aluminum gutters, which rust out in short order, and the ugly rust stains they causes. 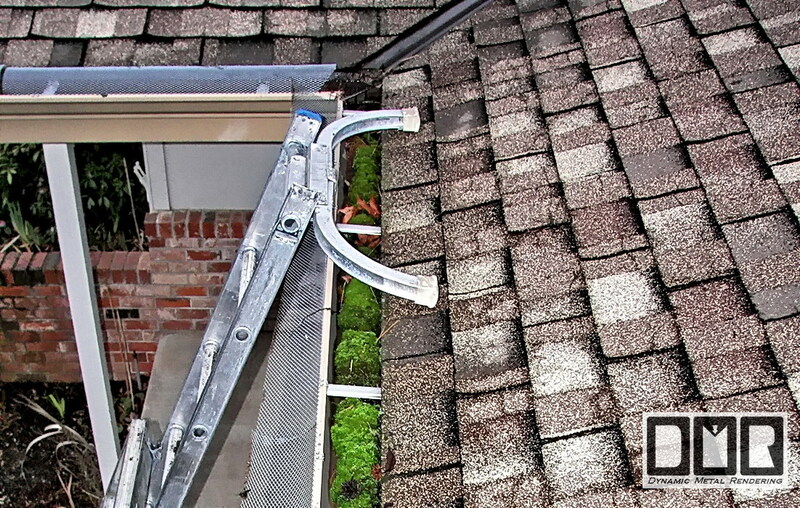 Which is by far the #1 reason gutter requiring replacement; by a margin of at least 70%. 2. No expansion joints as recommended by parts manufacturers; which leads to corners ripping open and loosening fasteners from sideways torsion; causing damage, leaks, and wood rot in the rafter tails, which cannot be replaced. 3. 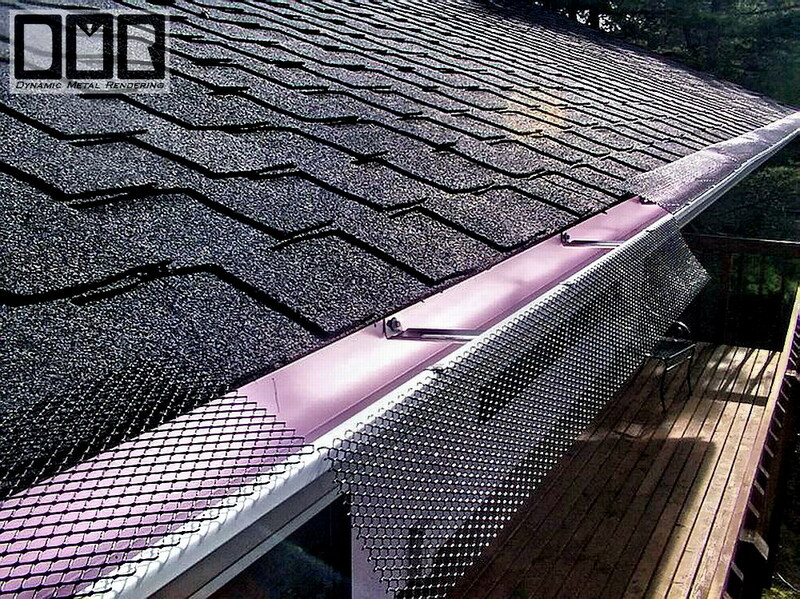 Cheap nail spikes that work loose; letting the gutter sag or dislocate. 4. Gutters that were mounted straight with the roof-line, without checking them with a level to be graded down towards the outlet; leaving standing water and debris in them long after the rain stopped. 5. Outlets which are too small and frequently clog several times a year, causing the gutter to fail. 6. Downspouts w/o curved elbows, which are noisy and get jammed up with debris frequently, which are very hard to clear out and not done with most gutter cleaning service. 7. Missing or ineffective roof flashing. 8. Installed less than Building Code minimum requirements. 9. A gutter cover that filters too well and fails to allow rain water in the gutter. 10. Far too expensive to be practical, and or being charged for more gutter length than you actually have. Yes, this is a very long list of common problems that I've seen time and time again when replacing gutters over the last quarter century. I could list many more issues I've run across, but I trust you get the point. How many of these issues do you suffer year after year? 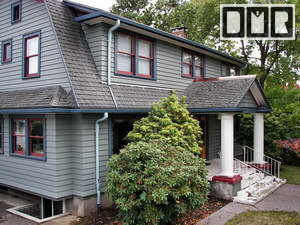 DMR Gutters serves to correct all these issues and many more on each gutter replacement I do. 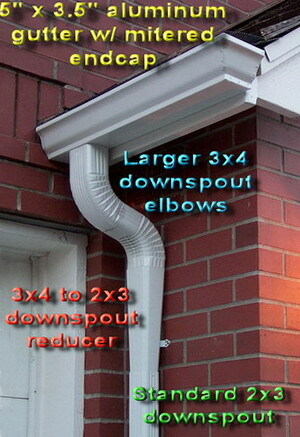 I also add move some downspouts (w/your approval) to improve the gutter function. Read over our Quality Standards Page to see what sets us apart from any other Gutter Contractor in our area. Even if you do not happen to reside in our area of the Country you can still use this list when interviewing local Gutter Contractors to see how they stack up. This industry will not change unless Homeowners insist on better than standard planned obsolescence. I can see from what parts are sold locally is what is used by other Gutter Contractors in this area, which clearly shows how I stand alone in good ethics for some reason. I have found the need to order parts from several different out of State suppliers to get better parts that not sold locally, because of such low demand for these better parts by local Contractors. Local suppliers will not stock these better parts just for my small contractor business. so why get more of the same junk, which had failed on you?" "Planned obsolescence should be a crime, because it is intentional fraud! Yet, is allowed as standard procedure in most industry. Which also contributes to our landfill issues far more than any other single cause"
As al licensed contractor I (David Rich) have done most of the work personally over the last 25 years+. Not having subordinated do most of the work, like most contractors. My reputation for quality work is far too important to let it fall to a greater production volume, so my work tends to be a lot slower than most other Gutter Contractors. 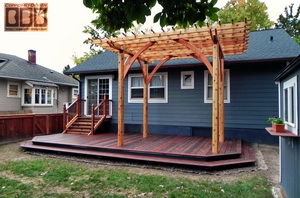 I often will suggest improvements that other contractors are not willing to do any any price. It typically takes us 2 weeks to do what other gutter contractors will crack out in a single day. I would like to think that this detail makes me well worth the wait, but that is certainly your call. You'll only get what was put into any project. Even without religious philosophy I like to believe you'll never meet a person who could honestly say "I don't mind living in a world of liars and cheats", so why is this such a problem in our society? If we all do not want to live in a world of lies and deceit then the least we can do is not add to that muck from what we put out there; as to our words and actions. Even when no one's looking. Unless we are honorable with those of our association; be it business and or personal, we have no right to even hope for any better from others, let alone expect it. We each need to strive to create the world we would hope to live in; regardless of what we may get in return. As an absolute rule, without waiver. We also need to accept how others have just as much right to live and prosper as we do; unconditionally! They should not be robbed through our selfishness. Beside unjustified WAR, this is manifested in many more ways than you could possibly imagine; in how we conduct our daily life and purchases. Please take some time to research 'Fair Trade'. I wish Ethical Responsibility was not such a rare quality in our modern business world, but wishing and waiting on the side lines is not going to change it. The best I can truly hope to accomplish in my life-time is to set a good example in every aspect of what I do. In order to show it is possible to still make a modest living while running an ethical business. My ideals are not because I was raised a Mormon in Utah. I have not found the LDS share my passion for ethics, let alone implement it in their actions beyond their pretenses, or else it would have impacted the business world a great deal more than it has: through fair competition. 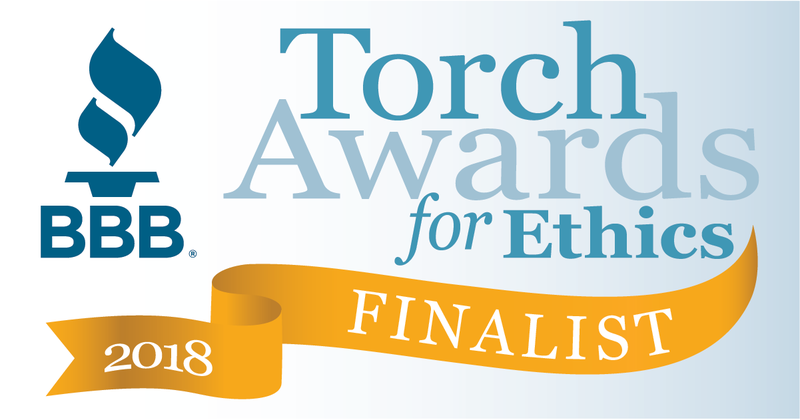 I can only hope to inspire others to seek out opportunities for good karma to enhance their lives and character through helping to enhance other people's lives in their chosen field of work; with compassion and care. Every aspect of all we do should be approached as an art-form with conscious intention. We can try to teach others how to live and love, but until they own it and becomes a part of them, this sort of philosophy will just be a pretty string of words with little real meaning. As long as we strive to set a good example perhaps those around you will eventually gleam wisdom from your example. You can not force it on others, and we need to be very patient, as they still need to grok it within their own time-line. Although, if we were to pass a law to make planned obsolecense the crime it truly is we could do more for the landfill issue than all the recycling programs put together. The above is a simple concept that is un-debatable (I dare anyone to try). These are words I strive to live by. Sadly, Our suppliers report that I seem to be the only Contractor in our Metro area who consistently buy the better construction materials? You can read more details on my thoughts of 'Ethical Responsibility'. I stand behind my quality with my extensive installation warranty (see: my Warranty & Service web page for details), along with the manufacturer's 20 year finish and 40 year parts warranty. I give 15 times the minimum labor warranty the Construction Contractors Board requires of all contractors. Along with my labor warranty, I also offer a 15 year no-clog warranty for new gutter installations with my low maintenance options package. I would be happy to offer a longer warranty, but I do not expect I will be climbing up 2 story ladders much after I am 70 years old, but I'll do my best to provide strong workers to take care of it. I pride myself on not making unrealistic claims. Have you ever seen this much moss growth inside a gutter? This is a clients home after they were able to leave their aluminum gutters alone for nearly a decade. I cleared this out at no charge, even though these gutters were still functioning with all that moss in them. One of the best aspects of these screens is how if you want to clean out the gutters you can easily see down in through these screens to see if there's a blockage. Without even removing the screens they can be simply rinsed out down to the Leaf-catchers, as seen here above. With these Leaf-catchers you can cover the screens in them during that rinsing, so even the small sand particles from the roofing will simply wash out the opening and not be washed down into your storm drain pipes. Even w/o my No-clog warranty can you think of a better system than this? I haven't been able to. No matter how much a Client may be willing to pay I have not found a better system. The best part is how this system is less expensive than any other No-clog gutter system you'll find, which makes this your most practical option and best possible value. 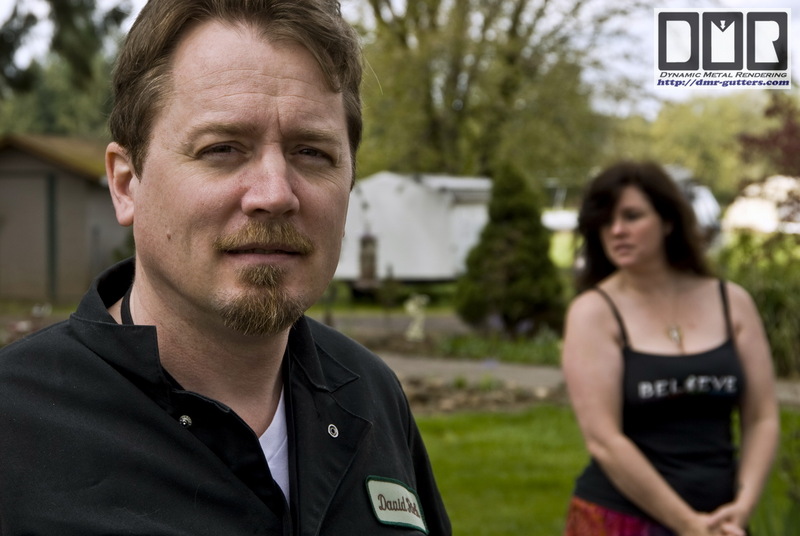 My name is David Rich; Owner, Salesman, and Installer. I'm rich in life, but not wealthy. I'm just a modest working stiff with a creative bent, and happen to have an unusually high aptitude for mechanical comprehension, spatial arrangement, and math. I've been servicing the Portland metro area with aluminum and copper No-clog gutters since mid 1993, and a year prior to that before I filed for my CCB #92250. In alphabetical order I've personally worked on houses in Albany, Aloha, Banks, Beaver Creek, Beaverton, Boring, Cancy, Colton, Corbett, Cornelius, Corvallis, Dallas, Damascas, Dayton, Eagle Creek, Estacada, Eugene, Forest Grove, Gaston, Gladstone, Gresham, Happy Valley, Hillsboro, Hood River, Lake Oswego, McMinnville, Milwaukie, Mololla, Mulino, Newberg, North Plains, Oregon City, Portland, Rainier, Rhododendron, Salem, Sandy, Sauvie Island, Scappoose, Sherwood, Silverton, St. Hellens, St. Johns, The Dalles, Tigard, Troutdale, Tualatin, Vernonia, Warren, West Linn, Wilsonville, Yamhill, and even a few houses on the Coast. I'm just not licensed to work outside Oregon, so I cannot service the Vancouver/Camas area. I feel my mission in life is to rail against 'Planned Obsolescence' in all forms, and champion Ethical Responsibility, which as you must know is sadly lacking in most business practice these days. I at least do what I can to set a good example for other Business Owners, which is the best we can realistically hope to accomplish in life. Feel free to get plenty of bids from other Gutter Contractors, but I can assure you that you'll not find a better value elsewhere. Please use my Quality Standards list linked above while interviewing those other Gutter Contractors to protect yourself against their lies and greed. You'll see from the reaction you get as you read off my quality standards where their standards lack. 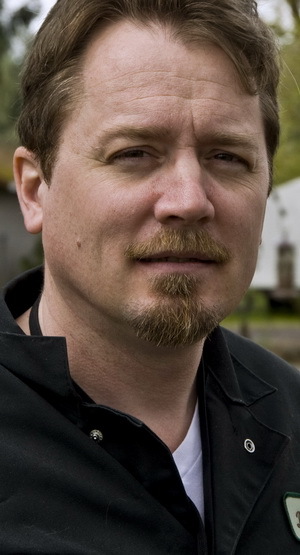 I would love to hear about your experience, even if you are not local to the Portland, Oregon area. If they say they cannot get those better parts I list that is very telling and you should not hire them. If they claim they will do what I do they are most likely going to charge you twice what I would, and still not do what I do at any cost when it's all said and done, sadly. I'd love to be proven wrong; to hear there may be other ethical Contractors out there. There are several Contractors in our area who sell just a gutter cover and charge as much as DMR Gutters for a whole gutters and downspouts replacement w/our No-clog options included, if you can believe that. No joke. 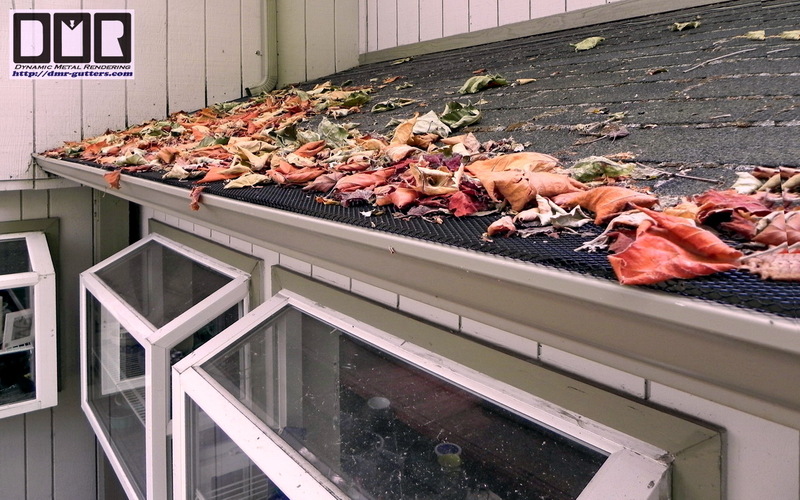 I have regularly under bid LeafGuard's aluminum system with our thicker than standard 20oz copper no-clog gutter package. Even if they worked as good as they promise, which would you rather have to add value to your home? This may all sound like just fancy hype; 'too good to be true', but just one highlight of my Quality Standards is my exclusive 8X building code strength gutter installation w/#12 high grade stainless steel screws and stronger hidden hanger brackets, than what are sold locally to Gutter Contractors. We use a pair of SS screws every 2 feet with stronger rust free Hidden Hanger brackets that I have to special order from back East. 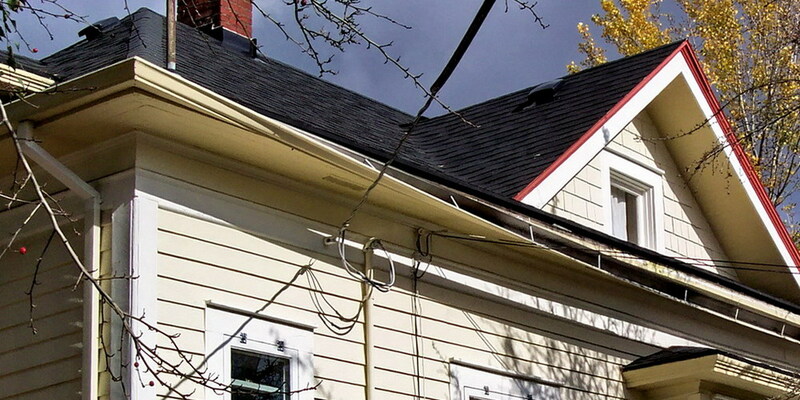 These stronger hidden hangers cannot be acquired locally, because a lack of demand by the other Gutter Contractors in the Northwest for these better parts. That is very telling in of it's self. When getting bids look for the reaction you'll get when asking them about this one detail. 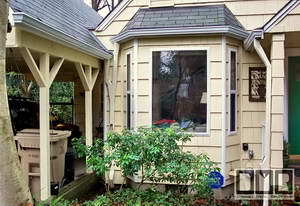 Most Gutter Contractors will only follow the minimum Building Code of just 1 nail every 4 feet. Building Code was not meant to be used as an instruction manual of how things are to be built. It is the lowest standards Licensed Contractors are allowed to get away with. When working on any project it tells a story. We see evidence of how what was done clearly had not been good enough; it is suppose to be our duty to find a solution to those failures we find when replacing anything on your home. But this does not seem to be the MO with most Contractors. Their Salesmen may talk a good hype, but I've seen all to often how they do not have their workers do as they may have promised. Oopsey. We need to remember the old saying of how to tell when a Salesman is lying: 'you can see their lips moving'. from the other side as a Subcontractor that's what I've seen in most every case, so I don't work for General Contractors any more. When they talk to you they may act like they care, but from the other side of this we see their only interest is to skate the line of a one year minimum warranty to save every dime they possible can. At 18 I worked as an Auto Mechanic in my Fathers repair shop for a few years back in 1980, but it proved too difficult to work for family. I then worked for a General Contractor before getting my own Specialty Contactors License in gutter work back in 1993. Since then I've specialized in gutter replacement. 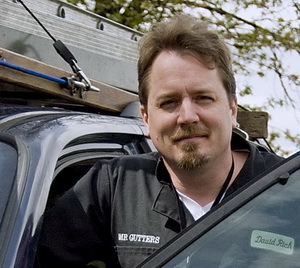 I've personally replaced gutters on over 1,500 homes over the last 24 years. That's nearly half a million linear feet of gutters and downspouts I've personally removed and replaced with only rust free metal. Many on houses less than 5 years old due to the poor quality of steel fascia gutters their Builder had installed originally. Those Homeowners were so fed up with how frequently they would fail in this NW area with all the tall trees we have, because of the rain we get around these parts. If their Builder had not been so cheap they could have avoided a great deal of stress as well as cost for having to replace the gutters so soon. I have seen this even on the ritzy Street of Dreams houses. Why get more of the same junk you have to replace now I say? When I've remove worn out gutters it tells a story; why am I here? Most of my work has been from old steel gutters that had rusted all the way through, so it seems quite clear what not to do this time around. Besides all that experience I am well equipped to solve unique problems you may have; with custom solution to your situation, that is simply not available from most Gutter Contractors. 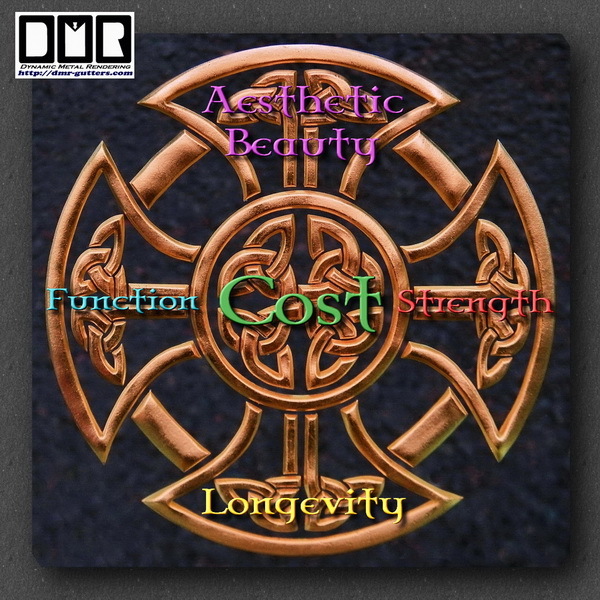 My work has graduated into a custom copper sheet metal design and fabrication shop that I promote through my other web site Copper-By-Design.com where I've designed and created thousands of original decorative and functional rain management products for clients across the Nation. I have discovered alternative resources (not found in this State of Oregon) for better gutter parts than what is sold to Gutter Contractors here in the Northwest. I've had to order these special gutter parts from 9 different suppliers in 5 different States across the Country to get the higher quality parts I insist on. 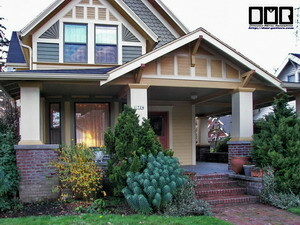 I do not offer lower cost options to present Homeowners with a lower bid, like other Gutter Contractors. If I know those other parts don't work long term why would I bother to offer them, let alone be willing to install them? I've turned down huge copper gutter jobs when the plans called for old style half round gutters, only because it goes against my ethics to install such a flawed gutter profile. There are several good reasons that particular gutter profile had become obsolete over half a century back, which is why half round gutters are so hard to come by these days. Expensive does not always equate to better. If they were just half the cost they still would still not be worth the trouble to install. Fascia gutters are not any better for several reasons, as explained in more detail on our FAQ pages. Some like the plain 'modern' look, but with so many disadvantages they are far more trouble with little to no advantage. Maybe in California gutters can be added as a nice decoration to a house, but in this area we cannot afford that sort of luxury when they will not function w/o constant maintenance. How can we be sure your system will last? I am very passionate about this issue and do my best to fight such corruption by at least setting a good example in the business community in every aspect of what I do. Any product is only as good as it's weakest link, and the paint coating is of course the most fragile aspect of aluminum gutters, which is why I've been replacing gutters with solid copper on about half my job over the last few years at a much more reasonable cost. 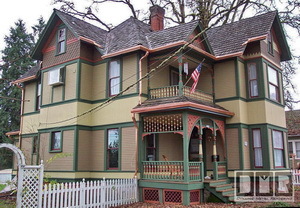 Usually my copper gutters are only twice that of our aluminum bids, even though copper parts cost me over 5X more $. Regardless of those unrealistic 50 year claims; paint simply cannot hold up more than a couple decade at best. Ponder for a moment the durability of any automotive paint. 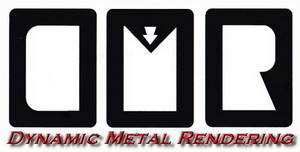 Which is much better than you'll find on any metal construction product. I ask you this 'what car have you seen that did not need repainted within 2 decades? That's even when you've had it waxed regularly. What would it cost to have your metal roof cleaned and waxed every 6 months? It simply does not happen, and I know those paint coatings scratch a lot easier than any original automotive paint, which clearly demonstrates what a false claim that is. As a highly ethical person my greatest challenge is to design each products with the best blend between: Aesthetics, Function, Strength, Longevity, and of course at a reasonable Cost for the best benefit to our clients. These 5 elements do not naturally blend together cohesively, but are more apt to oppose each other. So my challenge is to reach the best possible balance between each of these important elements. Not to push what I want to sell for the best profit margin like most Salesmen willing to tell you outrageous lies to make that sale. Why use a life-time metal like aluminum or especially copper if it is poorly installed, or so thin and weak that it dents easily and more prone to wind or snow damage; making it look terrible within a few decades? I will never build in planned obsolescence! 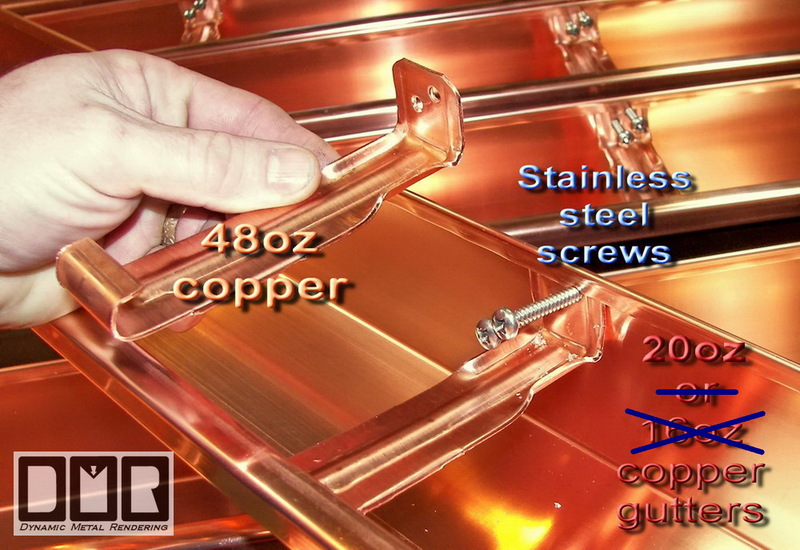 I even use a thicker 20oz copper, which is not even sold locally for most copper gutter jobs we do. Working with this philosophy in mind other than this web presence I've had no need to advertise locally over the last decade +, or do home shows to desperately reach new clients, as most businesses do. I've personally invested thousands of hours in this comprehensive web site, because I feel it is important to clearly communicate with my clients in this way. Not because I need the work. Also I hope to help teach, or at least influence other Gutter Contractors; showing them how it should be done. Feel free to get plenty of bids and do your part to ask them about many of the Quality Standard details I list on this web site. That will let them know they have some serious competition, and need to raise their standards to compete. If they claim they cannot get the same parts I use, you'll know their lying. They just don't want to bother providing you with a better service, so you'll know not to hire them. I have benefited from reaching the more intelligent clientele (such as yourself) who use search engines or one of the many Consumer Protection web services to find better than standard Contractors. I show proof of the highest quality standards and integrity you will find, with glowing reviews on Insider Pages and other web sites. This is a direct compliment to you, since you are reading this now. Why not go through a General Contractor? In theory their only job is to be your personal advocate to oversee the work of their Subcontractors to make sure it is done right, but the reality turns out to be quite the opposite. They are competing with Specialty Contractors like myself who sell directly to Homeowners, yet they still want $1k profit from each Subcontractor they have to deal with. I have not had good experiences working for General Contractors as a Subcontractor for several reasons, and have graduated my business to hardly ever working through them over the last decade. Even with my custom copper work I've been working directly with Homeowners about 95% of the time. Maybe this will help you understand where I'm coming from; in dealing with clients who have a direct investment in the quality of the work I do, they greatly appreciated the extra effort I put into each project. Where General Contractors are thinking more about their bottom line. Every $ they get away with saving is a $ in their own pocket. 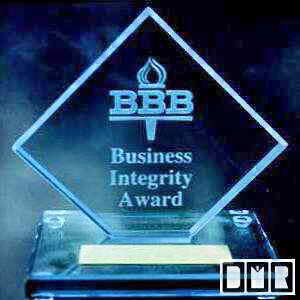 They have proven time and time again to be nothing more than unethical glorified used car salesmen, not to be trusted. They will do a great job pretending to care about you and promise to do the best possible work for you with top quality parts, but from the supplier end we see a whole other side that directly contradicts this. If I believed in Hell I imagine there would be a special place set aside for most Builders and GCs. Are you a 'Green Company'? More than most Contractors long before it was a catch phrase. Over the last 2 decades I have been able to recycle about 95% of the construction debris we remove, and do not leave behind any construction debris behind. We use more economical work vehicles and have our gutter machine on a separate trailer, so we do not have to drag it around with us for over 90% of the driving we do. We process the gutters here at our shop for most gutter projects, so that is less trips and less visual and noise pollution as well. 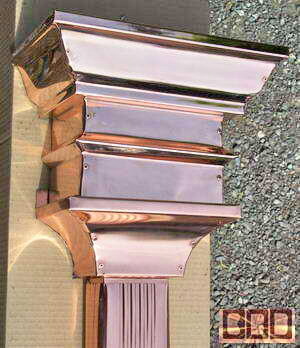 I have also designed and built hundreds of custom copper rain wear for clients out of State through my other web site Copper-By-Design.com. I use to do roofing and masonry work back before the year 2000, but the liability insurance being 5X the cost was too much for what little volume I could manage to do each year. Even if you are not local to the Portland, Oregon Metro Area this web site also has a wealth of valuable information about gutter installation, other rain management, roofing and moss control. Believe it or not I'm still just a small time hands-on Gutter Contractor, which is how I have maintained the highest reputation for quality you will find in the country, or in most any field for that matter. Who Killed the Pneumatic Car? This may be a bit off topic, but I have a question for you to consider: why has pneumatic motors for cars and larger trucks been suppressed for nearly a century now. Especially when it still beats the pants off hydrogen or electric cars? Diesel trucks still use this sort of pressurized air for their suspension and brakes. This is just pressurized air driven motors, like the power tools auto shops use, so it's not a new tech at all. They now make 5k PSI tanks with carbon fiber for better safety and less weight like they've been using for scuba divers and Firefighters for years, which has recently proven to provide up to a 200 mile range per charge in small cars in Europe. It has no pollution to speak of, and no risk of a violent fiery explosion if in a serious collision. This also has a far less hazardous land fill issues than old lithium-ion batteries, as well as a fraction of the cost and weight for the energy source storage. Less expensive processing, which can be set up at any fueling station for a fraction of the cost to recharge a tank in just minutes, compared to hydrogen refueling. Another very important yet suppressed issue is aluminum alloy frame vehicles. Over 20 years ago Honda made their first sports car with an aluminum frame, suspension, and body, yet we still have to buy these heavy steel cars that rust to this day. They claimed most people would not spend that much for a car, which would save them 25% on fuel. It is true that you had to spend over $1k for a decent bike with an aluminum frame back then, but this no longer holds true today, when you can now get an aluminum frame bicycle for $200 at Wal-Mart. I can only imagine that OPEC had organized their oil companies to invest their profits in buying controlling stock in all the automakers around the world to force them to continue to make heavy cars that get poor mileage just so they can sell a little more petrol. This is also why steel flashing is used on most roofs still today, so they can sell more asphalt shingles, causing 150% more hazardous landfill than necessary each year. These are the Monsters we are fighting, and we are getting desperately close to loosing this battle for survival against their unethical business practices. Wasn't the Gulf Coast spill enough of a wake-up call? PS: I have no financial investment in such to cause any bias here. My aim is just to help break our dependence on fossil fuels with better options. Please write to your Congressman and tell them about this new/old tech to save our planet and society. Also, spread the word to as many people as you can to put pressure on 'The Man' and force these issue out into the light of day. Beyond the many advantages we offer for standard gutter replacement we also offer No-clog options that not only work better long term than our competition, but are more cost efficient than most any other devices you may have seen. I have lots of proof of this, but sheer logic is my best weapon. You should keep in mind that window screen is too fine of a weave to be practical as a gutter cover. It may keep out more of the smaller debris, but it will wind up keeping the rain water out of your gutters as well before long. It is just too fine and will become caked with debris, which will cause the rain water to cascade over the outside edge of your gutters. In that case you might as well just remove your gutter system all together. Any gutter cover with that fine of a straining is not worth installing, let along the outrageous cost they want for those flawed products. Gutter covers need large holes and lots of surface surface area to allow the rain water to sift into the gutters, before dropping off the outer edge. It will still keep out the larger debris like branches, pine cones, large leaves and toys, which would clog a gutter quickly. There will still be small debris getting through, which is why the larger outlets are so important. Your gutters could be as large as a bath tub, but if the outlets are still the same small size they would clog and fail just as quickly. The metal screens I use have twice the open area than plastic screens and last longer under the UV rays of the Sun. It is true that these will not keep out all the smaller debris and you'll have moss globs growing inside your gutters over time if you are truly able to leave them alone, but that's where the larger outlets and the Leaf-catchers I make come in to form a good functional and practical rain management system at a reasonable cost. 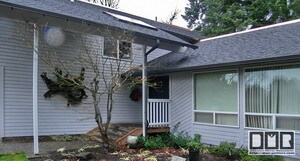 As you may have become aware of by now those costly metal hood gutter covers fail in short order. If any debris gets trapped in that small groove the water is suppose to use to get into the gutter that rain water will simply cascade over the outside of the gutter. Many of these companies pushing these covers will adamantly claim they will guarantee the gutters will not clog, but they will never guarantee the gutters will continue to accept water. 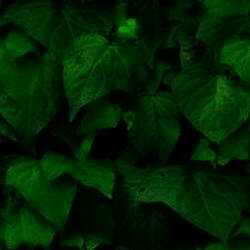 They also create a perfect dark moist breeding ground for moss and become filled with large moss globs that will keep rain water from passing sideways to the outlets, or even to enter the gutter. One of the worst details is how their metal covers cost more than our copper gutters and screens. I believe a gutter cover no matter how good it could possibly work should never cost more than a new aluminum gutter, or it is impractical, no matter how well it could work. The worst part is how pretty much all of them are a scam at any cost and they know it. Not that you'll ever get them to admit it, Trust me, I've argued on the phone and on-line groups with their sales reps for hours trying to get me to sell their faulty product. They clearly have no conscience. 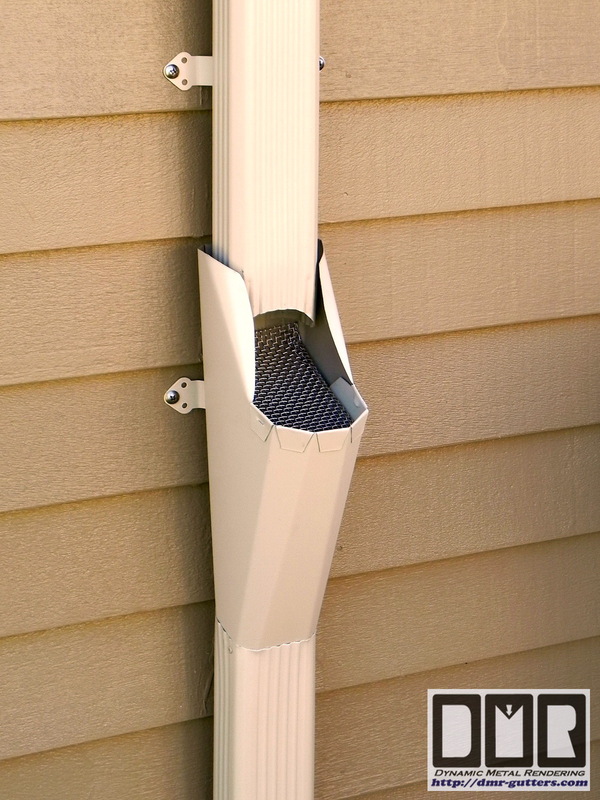 Remarkably most Homeowners do not realize the single best advantage to any gutter system is the size of their outlets, but you do not need an industrial size downspout running down your wall. If you had a bigger gutter with the same size outlets that would only mean you now have 5 minutes in stead of just 3 minutes in a heavy down pour before the gutter over flows after the outlet clogs yet again, which as you should know is the most common cause for gutter failure. That's why Leaf Guard ® hinges their warranty on the use of the 2X larger industrial size downspouts, which I also use, but with a less expensive detail that looks better. It is best to have a strainer down low where it can be easily accessed w/o a ladder. Strainers up in the gutter are death to gutters. A strainer up in the gutter is the opposite of a larger outlet. My aim is to make a gutter system that will continue to function w/o having to get up on the roof in the worst of weather, when you finally notice you have a problem. Although the larger DSP is not needed for the vertical drop, so I install these reducers up high to minimize the looks and cost. We designed and make our own downspout strainers with a much stronger stainless steel screen in them than any other gutter system strainer we've seen on the market. We have been using them on most gutter replacement we've done over the last 2 decades, and modified it's design several times making improvements to the look and function over the many years of client tested results. These are a $50 option per downspout made in aluminum w/stainless steel screen. 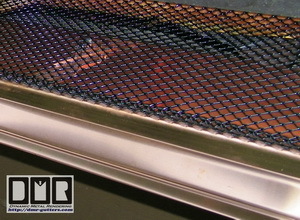 Or a $70 option made with 20oz copper w/stainless steel screen. That a good value compared to paying Roto-Rooter $75 to $100 an hour to clear out your storm drain system. These strainers are our most popular feature of our work and the main reason clients hire us to replace and improve their rain management system. it is rare we have had Homeowners not want this feature. These Leaf-catchers are not needed if you do not have an underground storm-drain system. Although, if that's the case you are better off without gutters on your house and just let the rain water dribble off your roof along the bottom edges. If you have gutters it is imperative how that rain water is effectively carried away from your foundation whether you have a basement or not, or they are doing more harm than having no gutters at all. 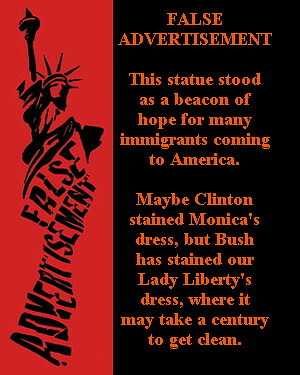 Click on this image to read the magazine article in a National Consumer Protection web site, which has the initials A L, where I was interviewed to discuss my thriving business during this recession for their July 2008 issue (they requested not to be named here). It seems I was the only Contractor in their poll who said their business was doing better than ever. I attributed my success to doing better quality work at a more reasonable price, along with good communication though easy phone access, this extensive web site, and swift e-mail replies. Because of my diligent efforts here I have been told by dozens of clients how this web site is clearly the most comprehensive web site on rain management in the world: with over 300 web pages spread out over this business web site and http://copper-by-design.com along with over 5,000 digital photos that link to full screen images for a closer look. Many link to a whole separate web page with a gallery of related photos and a more detailed description of that project. They also love how I'm one of the few who list the cost of those projects, so they can do anonymous price comparison shopping w/o having to suffer talking to a high-pressure salesman. I'm happy to do free on-site quotes for local homeowners within 20 miles of our local area, as the CCB requires of all Licensed Contractors, but I have found it works best to develop more of an interactive partnership with my clientele by working out some of the details through e-mail first (see Latest News page for details). These days pretty much everyone has a digital camera on their phone and knows how to send pics through e-mail. I have had to do this with most all my non-local clientele over the last 9 years for the custom copper fabrications I do, since most of them are located back East of the Mississippi. I am still a hands-on contractor, so I couldn't possibly drive around town all day filling all the bid requests I get, let alone do the volume of work I could sell, so I request a simple pre-qualification effort on your part. I would not be able to get any work done otherwise, as I am already booked several months out. I will not sacrifice quality for a larger production volume. This was the most impressive restoration I've ever seen. He said my bid was $14k less than a competing Gutter Contractor. 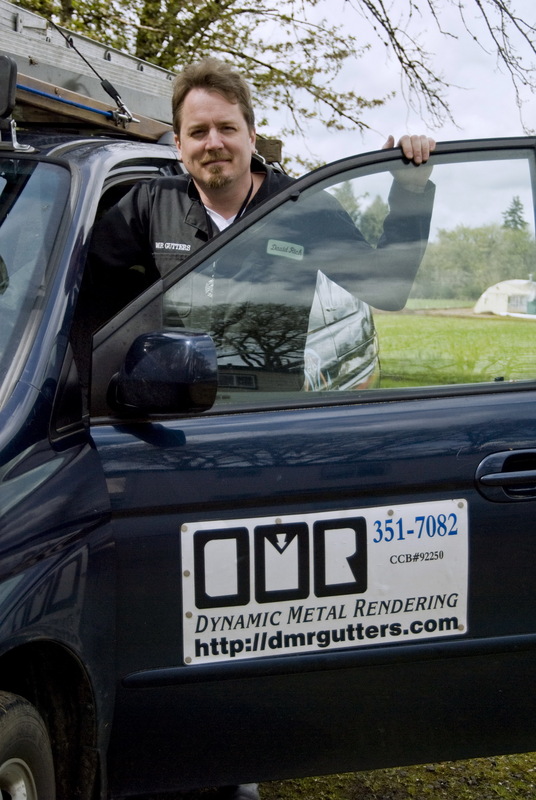 DMR Gutters is just a small company in Portland, Oregon based just 10 minutes South of Down Town. 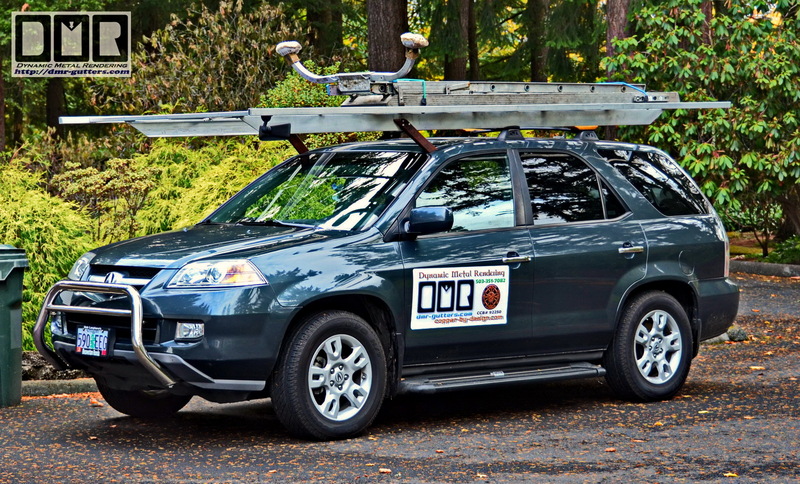 I've been licensed, insured, and bonded for sheet metal work in the State of Oregon under CCB #92250 since 1993 without a single dispute filed with the CCB. 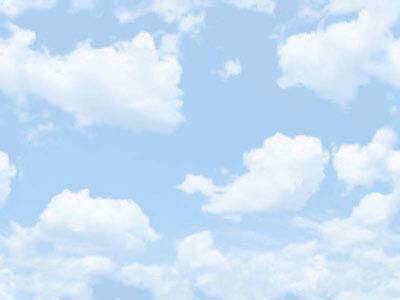 With the high cost liability insurance for Roofers I am prohibited from doing any roofing related work. More specifically I am a Specialty Residential Gutter Contactor. I've also built up a custom aluminum and copper fabrication shop. 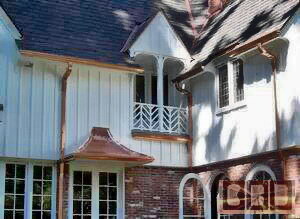 I have specialized in sheet metal rain management products for nearly 2 decades now and have graduated to building elaborate custom copper chimney caps and turret roof caps for clients across the Country. Before the year 2000 I carried the type of liability insurance to do roofing as well, but since the cost of that insurance is 500% higher than any other types of construction it was too expensive for a small company like mine, who cannot possibly do enough volume to cover that expense. That's sad, since in my travels I have yet to see evidence of a decent roofer who is committed to doing good work and use materials designed to last more than a decade (no joke). The reason is because contractors are only required to provide a 1 year warranty on the work they do. After the Homeowner had exhausted their efforts to deal directly with that contactors and then had to resort to filing a complaint with the CCB for mediation; it has to be filed within 1 year of completion or it is an invalid complaint and thrown out. Meaning that Contractor is off the hook for any negligent work they did. I know I would not want anyone working on my house who only expected their work to last a little over a year. 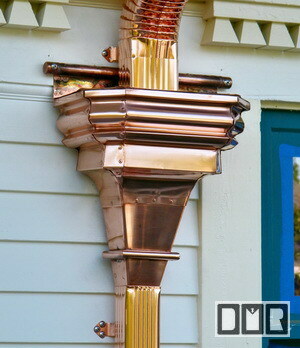 Here is one of the custom copper projects I build shown above. This was shipped to a Lake house in Seneca Falls, New York. 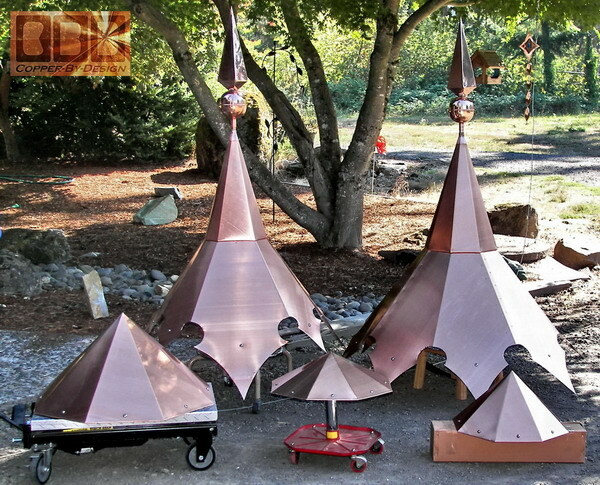 I also make custom copper roof caps for turrets and gazebos. Most of the custom work I do is fabricated with a heavy-duty solid 20oz copper or thicker. 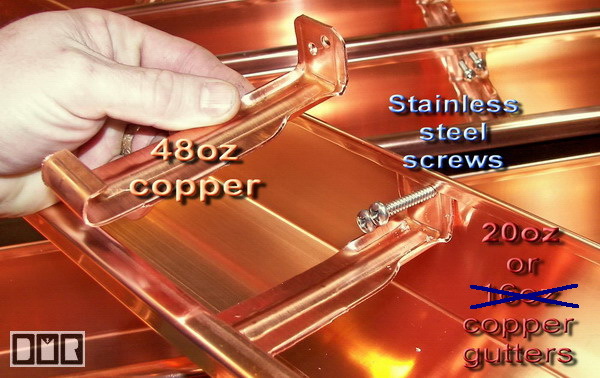 Some times 48oz copper is used, which is 3lb per square foot and is too thick to cut with tin snips. 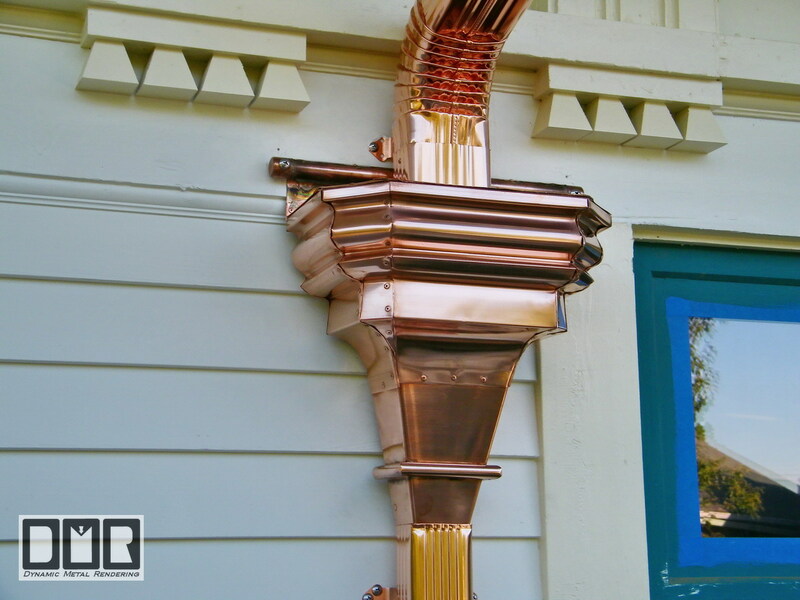 You will see a lot of copper gutter photos here and other custom work, but many of the gutter work I've done over the last 2 decades has been in pre-painted aluminum sheet metal. I refuse to install steel gutters, because I do not believe in planned obsolescence, so it goes against my ethical values. For my latest availability see my Latest News web page. Watch out for Gutter Contractors pushing steel gutters! A little history: Back in the 1960s when aluminum was developed as a cost efficient rust free alternative to steel gutters people started seeing it in all the adds, so most all Gutter Contractors had to switch over to compete. After a while it was not much of a sales advantage, since it was so common-place. We saw it less and less in adds as the catch word and we all expected the Gutter Contractors were using aluminum still, but sadly most Gutter Contractors reverted back to using steel for gutter fabrication to unsuspecting clients. Through out the last 3 decades Builders have been using steel for gutters on over 90% of new house construction. 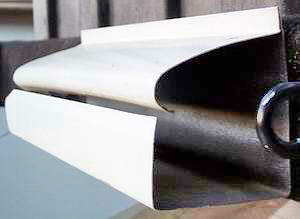 Most fascia gutters are steel and will attract a magnet, unlike most any other type of metal. Why not steel? Depending on how frequently you had your gutters cleaned out steel gutters will last between 10 to 20 years before the metal has become so rusty that it has holes through the bottom and cause nasty rust stains as well. The steel downspouts those Gutter Contractors use are even worse. They are prone to clog easily and are noisy for hours after the rain has stopped; drip, drip, drip ............... Steel can be detected with a simple magnet test, since the iron in steel is the only metal that will attract a magnet. This issue is very important, since rusty steel gutters accounts for over 75% of the need for gutter replacement. Gutters detaching from the house is the second leading cause, and here is a common example of that problem. There are more details on this issue at the top of my #2 FAQ web page. Why do I need to worry about these issues? Sadly most businessmen focus more on maximizing their profit margin over client service. They're relying on Homeowners not networking and just rely on advertising to reach new clients to snow. They see Building Codes and the CCB as a thorn in their side. Not as minimal recommendations like I do. Giving little to no thought of how they would like to be treated by other Contractors working on their own home. Steel for gutters is pushed because it is a little cheaper metal and offers them planned obsolescence for more repeat business. They will adamantly claim that steel makes for much stronger gutter, which is a lie they push to sell you on this cheaper metal that will not last nearly as long. Even if their claim were true; damaged gutters account for well under 10% of gutter replacement work, so it's only a minor issue at best. Try to see their obvious motivation for this deception they push. They are just fighting to compete with other Gutter Contractors for the lowest possible bid to make that sale, while making the maximum profit margin still. Simple as that. 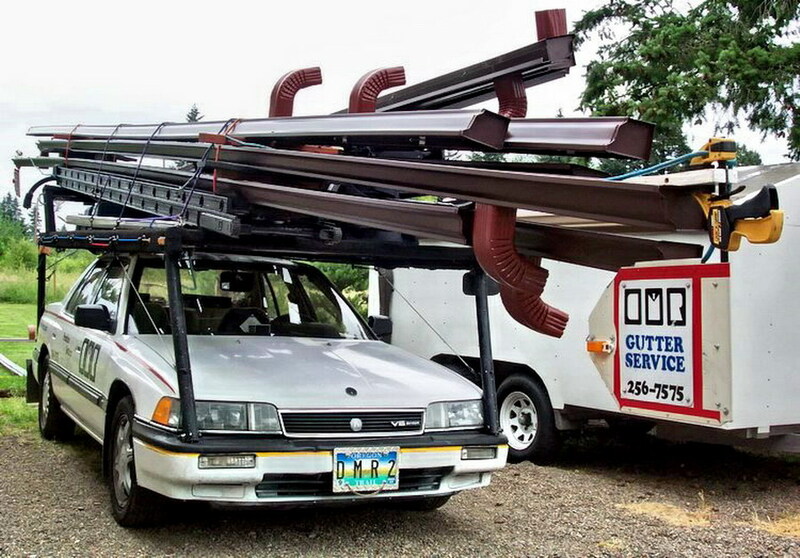 What is even funnier is how if they were the actual installer doing the work like I am; to lift those heavier steel gutters and struggle with driving in those 7" nail spikes while holding the gutter up on top of a 2 story ladder they would not work with steel. They are only slick talking salesmen that cannot be trusted. What do I need to demand? As simple logic would dictate if you have a life time metal for the gutters it does not makes sense that the other parts will not last. I only work with rust-free sheet-metal, other than the leaf screen for over the gutters. They should be willing to use stainless steel screws (nail-free) for a lasting hold. You will most likely need to test them with a magnet to be sure they are not just regular screws. Building Code does not require contractors to use aluminum or screws. Although, when aluminum is used for making gutters it is only to Code if it is a lot thicker than steel in order to make sure they are just as strong. So you have a metal that is about twice as thick as steel and will not rust. Realize how most of the money you pay for most any construction work is for labor and their business expenses. Not the cost of parts, so it is a waste to use cheaper materials that will not last 1/3 as long. What if I am not local to you? 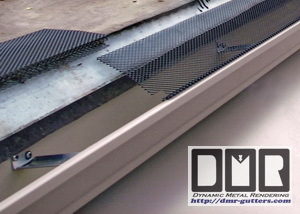 DMR Gutters also sells unique low-maintenance gutter parts and custom copper sheet metal fabrication to clients across the continental USA through http://copper-by-design.com . 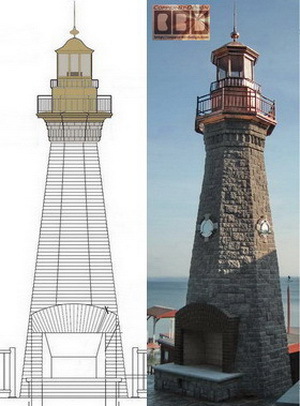 Like: gazebo caps, scuppers or leaderheads, and chimney caps. (see my 'Shipping' web page for details). I also provide some of the best unbiased advice on Roofing Quality Standards in the industry, as well as another web page on Safe Moss Removal and Effective Maintenance. I do have a toll free phone number, but please read my contact info page before calling us. 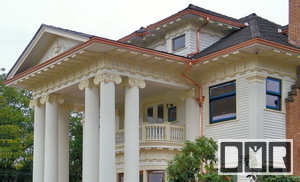 DMR Gutters is licensed to work only in Oregon State and prohibited from doing roofing related work, as the liability insurance for roofing is over 500% higher than all the other types of construction. There is no 'Gutter Workers Network' for us to refer a good local contractor to you. If you are searching for a reliable Gutter Contractor in your area this web site is one of the most comprehensive and honest web sites on gutters and roofing in the world. You should find the information here very helpful to better know what questions to ask from your local contractors, and be able to weed them out to find one that you can hopefully rely on. In doing so it should save you a lot of money and future headaches (three or four sets of crappy gutters would cost more than one good set, and less wear and tear on your roof-lines). If they claim they cannot do what I do or get the parts I buy for my clients as listed on this web site, that would be very telling, and you will then know not to hire them. They could also order the custom parts from us through this web site, or you can order these parts yourself. Note: If you do find the information here very helpful, it would be kind of you to show your appreciation for the generous advice I spent thousands of hours to provide here for your benefit. Perhaps this information was worth enough for you to send us a nice gift certificate for dinner at a local restaurant here? A favorite of ours is Newport Bay. Don't feel too bad about not bothering with this kind gesture though, since it has been extremely rare. Far less than 1 in a 1,000 take the time to even send us a nice note of their gratitude. You can find here that I also have an apprenticeship program and DMR Gutter franchises for new contractors to own my system of gutter installation, as well as help set-up a good personalized web site like this one, yet I've have few takers, since they would have to subscribe to my sense of good ethics for this to work out for them. Above left is an actual aluminum LEAFGUARD® gutter cross section profile that I have to show clients the clear difference. The image right shows my more user-friendly hinged copper leaf screen over my copper K-5 gutter for about the same cost as their flimsy aluminum gutter design. I was also a 1997 semi-finalist for this award as well. See my referral web page to see how I managed to be honored with this special award two years in a row. Who Would Jesus Torture or bomb? No, Seriously, Why Did We Invade? Doesn't that make us the terrorists? Rich Man's War, Poor Man's Blood: Is It Vietnam Yet?